There was a time pianos were tuned 2, 3 or even 4 times a year. Modern pianos might seem more stable, but even they should be tuned every 6 months - certainly not left untuned for more than a year! Pianos have personalities! They like being tuned regularly. You might suffer from ear ache when your piano is out of tune, but think of your poor, suffering piano! Do yourself and your piano a favour, arrange to have it tuned! A well tuned and regulated piano is a pleasure to play. All pianists should experience the joy of playing a piano in tip-top condition. 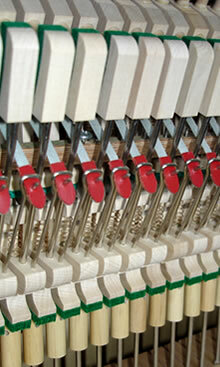 Very often, a servicing session can transform the tone and feel of the piano. Unfortunately, wear and tear are unavoidable. For pianos, the symptoms of wear and tear are: misfiring notes, sluggish and heavy key strokes, squeaks and clicks in the action, etc. - the list is endless. All these can be sorted at Pianology! Ever in tune with the aspirations of all who love playing the piano, Pianology is here to refine and improve your piano, or advise on the best course of action.